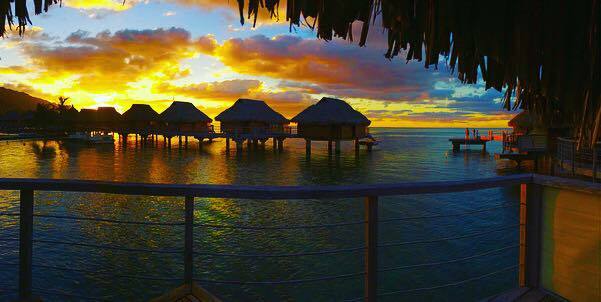 Bora Bora & Moorea, Tahiti — Denv.Her. I wanted to throw it back to my husband and I's honeymoon and give you guys an overview of our Tahitian vacay to Bora Bora & Moorea. The Tahitian weather during our trip was phenomenal. We went at the beginning of October and pretty much had incredible 80 degree weather the entire honeymoon. There were a 2-3 afternoon showers over our two week stay but they generally only lasted 10 minutes and then the blue sky would be back shortly after. The high season to travel to Tahiti is May - October so if you go to Bora Bora or Moorea any of these months, you should be just fine weather wise. The most imperative things to pack when going to Tahiti? Sunscreen. Bug spray. & lots of swimsuits #obvi. But seriously you guys, sunscreen and bug spray. Legit do not forget either of these or make sure to purchase a lot from your resort once you arrive. Tahiti is absolute paradise but you'll get roasted or eaten alive by mosquitoes if you aren't protecting your skin! Tahiti is also known as French Polynesia. Key word here, French. Regardless of knowing that Bora Bora & Moorea make up an overseas collectivity of the French Republic, I assumed most everyone would speak English. So, when we flew into the main island of Tahiti, Papeete (this flight was 7 1/2 hours from CA), I was not expecting the immediate language barrier when we landed. Everyone was either speaking in French or Tahitian & all of the airport signs and directions were in French and Tahitian. Neither Ross or I speak French (and we certainly don't know Tahitian lol) so we were stuck wandering around this airport for a good 30 minutes trying to find our connecting flight to Bora Bora. Mauvais quart d'heure! There was even someone from the travel agency waiting for us at the airport to usher us to our second flight and we totally missed him #likehow. This guy also had all of our travel vouchers for ferry and vehicle transportation while in Bora Bora and Moorea so missing him really threw us for a loop. #halp. With the culture shock setting in that Tahitian is the islanders prominent language, followed by French, THEN followed by English, I was mildly panicking about how we were going to find our way around. Needless to say, by God's good graces and several cuss words later, we did end up finding our connecting flight to Bora Bora. That blue water? Seriously not real life. Once we arrived at the Bora Bora airport - we took a boat from the airport to the main island of Bora Bora, Vaitape. On our boat ride over, there is a beautiful Polynesian statue on a small islet that welcomes you to the island. They call this statue Vahine E'ia which means Fish Lady. & seriously, look at that crystal aquamarine water!! I still can't get over it. Our hotel was on the main island of Vaitape so en route to our hotel, Dora was able to point out her favorite restaurants to check out during our stay. Soon we arrived at our hotel, Maitai Polynesia. We were greeted with beautiful leis and cocktails and then were taken to our over-water bungalow. Once we realized I had locked us out, Ross had to swim from the ocean back up to the hotel and go inside sopping wet to have someone come and let us back into our room. After some more swimming (WITH our room key available to get inside), I soon went to plug in my dying phone. For those of you that have traveled internationally, you'll know that French/European outlets are different from ours. "What the f*ck is this?" "They have different outlets than we do"
We went and rented a scooter from a vendor right outside our hotel and to go hunt for an outlet converter. Side note - my happy place is on the back of a scooter with Ross. Luckily, we were able to find converters at the v small (and only) electronics shop in Bora Bora. Being the only electronics shop on the island, obvi the prices were outrageous. BUT beggars can't be choosers and I wasn't spending the trip with a dead phone when one million pictures needed to be taken. After we purchased the exorbitantly priced converter, we found a cute little spot to stop and have lunch. 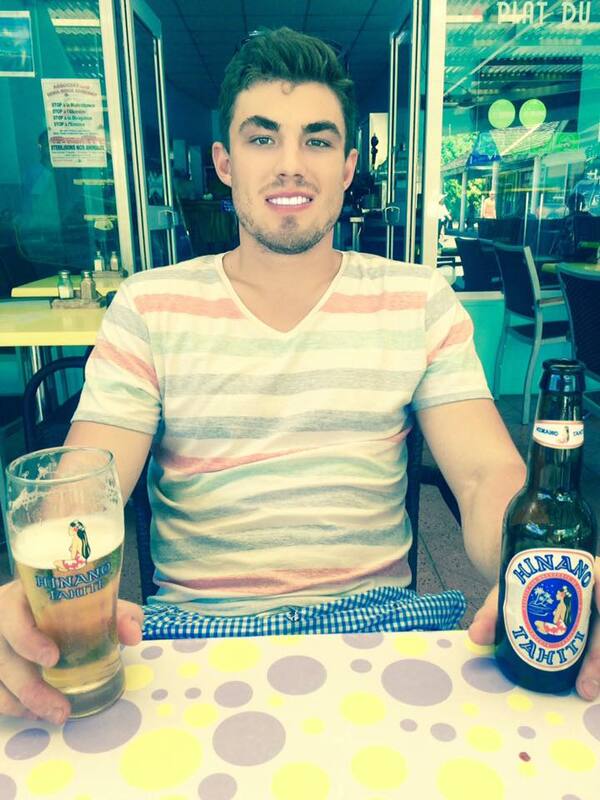 Here we got to try some Hinano's - the famous vahine beer of Tahiti. We'd be drinking these bad boys for the rest of our vacay along with a copious amount of Piña Coladas. I will warn all travelers going to Bora Bora and staying on the main island of Vaitape- there are stray dogs and cats EVERYWHERE, & it's gut wrenching. I legitimately was bringing bread and lunch meat everywhere we went so we could feed the strays we came across. I. LOVE. DOGS. So seeing all these homeless and hungry pups was super heart breaking. Ross was really sweet though and would always stop the scooter so I could feed the buddies we came across. Everyday while in Bora Bora, we would rent a scooter and explore the island. It only takes about 35-40 minutes to take a lap around the entire island. While scootering, we were able to get killer views of both Mount Otemanu and Mount Pahia. The restaurant at our hotel, Haere Mai, was great and we ate a decent amount of our breakfasts and dinners here. It was an inside/outside concept which we loved because with each meal, we were still able to enjoy the island weather. One of the lunch spots we hit in Bora Bora was Bloody Mary's per the recommendation of taxi driver Dora. This restaurant has been on the island since the 70's and is a hot spot for celebrities and artists like Jimmy Buffet, Johhny Depp, John Elway and more. 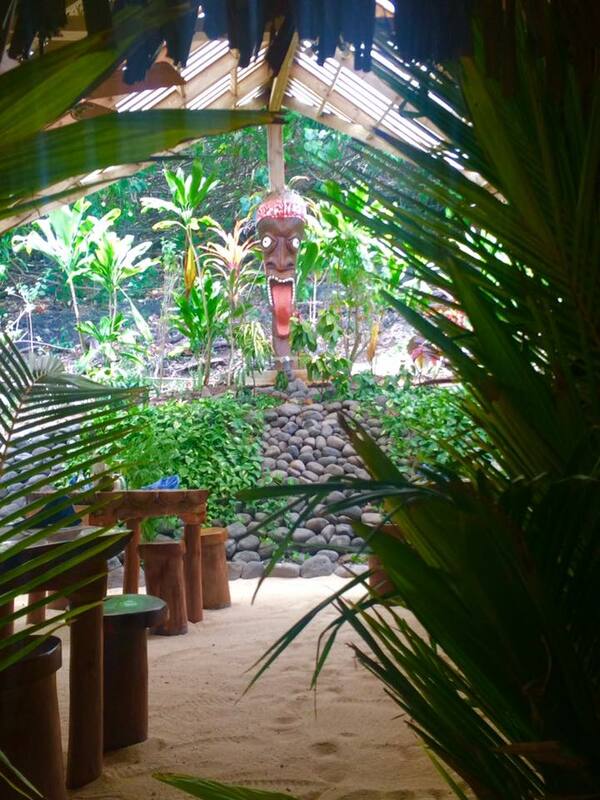 This restaurant is decorated like a tiki hut and has tiki sculptures to match. Bloody Mary's lunch menu features several burgers and sandwich options that are super reasonably priced. Bloody Mary's flooring is sand and is an inside/outside concept restaurant so make sure you're wearing bug spray here! Ross was getting bit on his legs pretty bad while we ate our lunch and was not a happy camper. But our burgers and drinks were great. Bloody Mary's has a dock right in front of it so if your hotel is not on the main island of Vaitape, you can get boated over and walk from the dock right up to the restaurant no problem. For another one of our lunches, we dined at Blue Coco (also per the recommendation of Dora). Blue Coco is an Italian restaurant with island influence. This was the best lunch we had while in Bora Bora. Blue Coco sits right on Matira's beach and boasts a beautiful view of the water. For an appetizer, we ordered the Tuna Carpaccio which was wonderful. For our entrees, Ross had the pesto pasta with shrimp and I had the prosciutto and mushroom pizza with goat cheese #everythingwithgoatcheese. Ross' pasta was good but my pizza was AH-MAZING. The best dinner we had during our whole honeymoon (and one of the best dinners we've had ever) was when we dined at Villa Mahana in Bora Bora. Labeled as one of the best restaurants in the world, this French cuisine dining experience more than lived up to its reputation. Villa Mahana is v intimate and only takes 25 customers a night. This being the case, make your reservations far in advance! We booked our dinner about 4 months out. The restaurant even sends a shuttle to pick up all customers for the night which was a nice touch. There are tables located inside and outside the villa. If you are seated outside - make sure to ask for bug spray! Villa Mahana is actually the chef's villa atop one of the hills in Bora Bora. 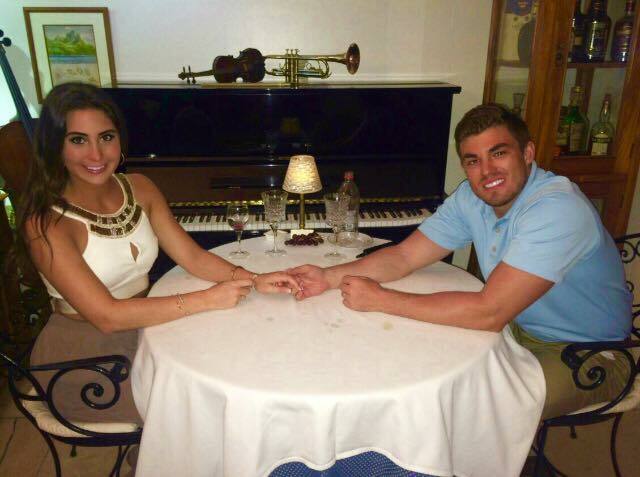 Upon arrival, we were sat right next to the grand piano where Katie Maloney and Tom Scwartz also sat on their honeymoon (fan girl moment, #vanderpumprules). Villa Mahana will also cost you a pretty penny but believe me when I say it is SO worth it. For dinner we chose of the Chef's Tasting Menu and chose the Menu Epicurian which highlights the restaurant's French dishes in a 5 course meal (each course paired with wine or champagne). The Menu Epicurian runs $420 per couple (once again, so so worth it). The Menu Epicurian began with a Seafood Salad and Caviar paired with Champagne brut. This salad was great with v refreshing flavor. Then came the Foi Gras which is seared duck liver with sweet spices and it was paired with Sauternes which is sweet white wine. This was Ross' and I's least favorite of the meal but it still was amazing. We're not huge Foi Gras fans because the texture is so bizarre but we still ate every bite. Next up was King Lobster and Black Tiger Prawn Risotto with Champagne Sauce. You guys, I had died and gone to heaven with this course. This was my favorite course out of the entire meal and I can't even begin to explain how much we enjoyed this dish (but I will give it a try). The lobster was fresh and juicy and the risotto was cooked to creamy perfection. It's one of those dishes that hits your palette so perfectly with all it's flavor that all you can do is give a "Oh. My. God." The Lobster and Prawn Risotto was served with Chablis Grand Cru wine. Next up was the Roasted Beef Tenderloin Filet in a Red Wine Vanilla Sauce served with Creamy Gnocchi. At this point Ross and I were V full so definitely take your time with this meal. We were even making a conscious effort to not eat too fast but the food and drinks still caught up with us. For dessert, we were served warm and creamy Chocolate Cake with Vanilla Ice Cream. We also received some end of meal Macaroons. I love my sweets so couldn't say no to any of these treats. The desserts were served with Porto Tawny and were delish. The perfect ending to the perfect meal. 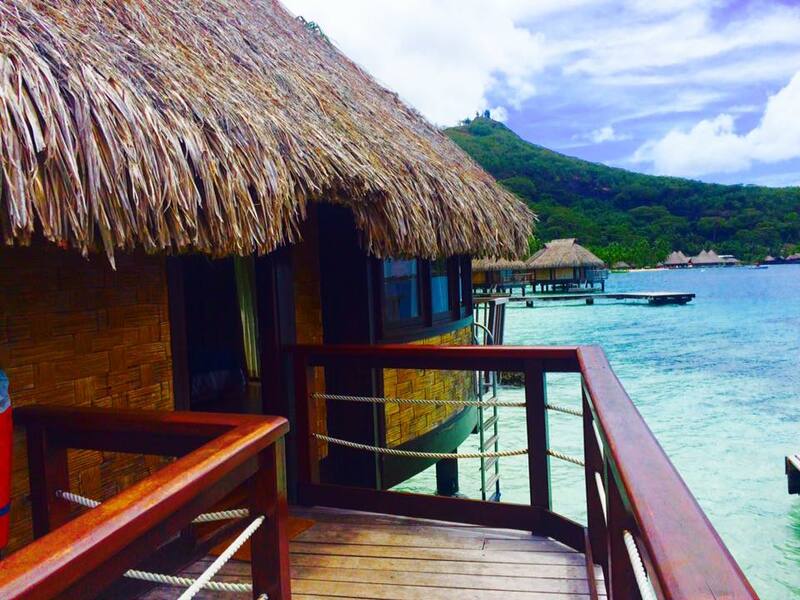 If you ever go to Bora Bora, Villa Mahana is a must. Just be careful with the wine & champagne pairings. I was hungover AF the next day lol. For activities in Bora Bora - we did a lot of scootering and swimming. Most all the hotels provide water toys so we also were able to snorkel and kayak quite a bit! When Ross and I were kayaking we would load up the boat with Hinano's and do a little booze cruise on the water which I def reccomend. But ultimately, Bora Bora is for relaxation. I read three books during our time there & really just soaked the island in. It's a low key, no hustle and bustle type of place so get ready for some serious R&R while you're there. After our time in Bora Bora, we made our way back to the airport and took a 45 minute flight to Moorea. 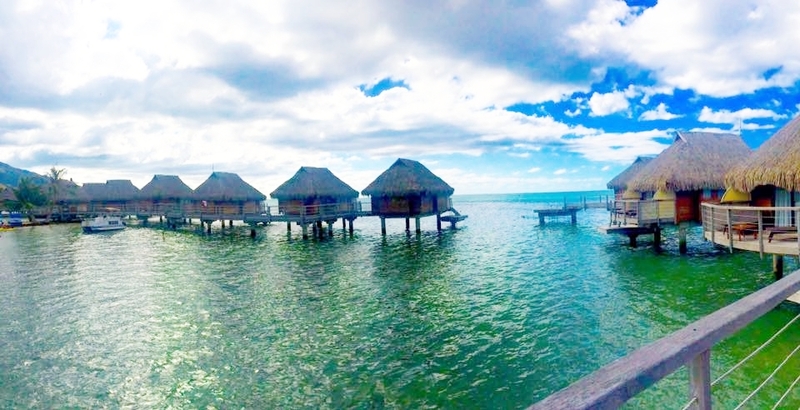 While staying in Moorea, we were at the Manava Beach Resort and Spa. This hotel was beautiful and we were once again in a bungalow over the water. & guys, the Moorean sunsets at Manava took our breath away. I've never seen ANYTHING like these sunsets - they were utterly magical. Take a look. 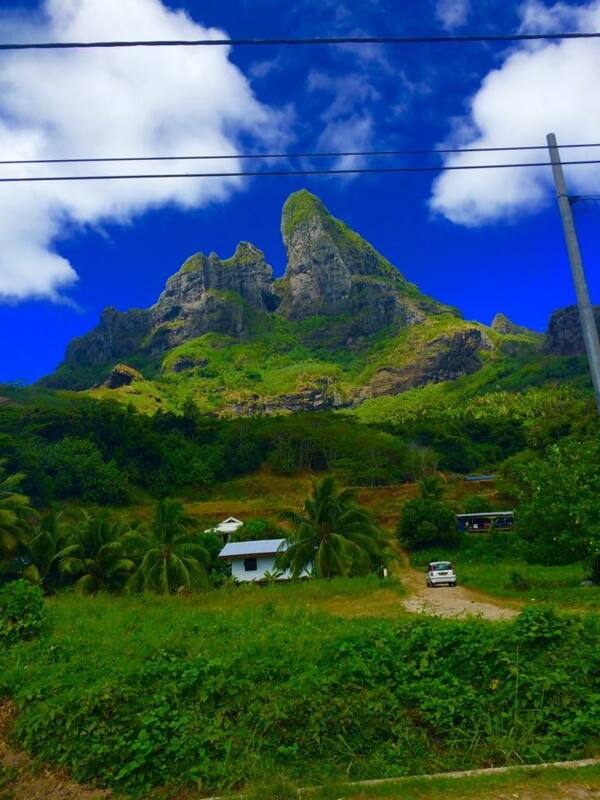 In Moorea there are a lot more activities to get involved in than Bora Bora. 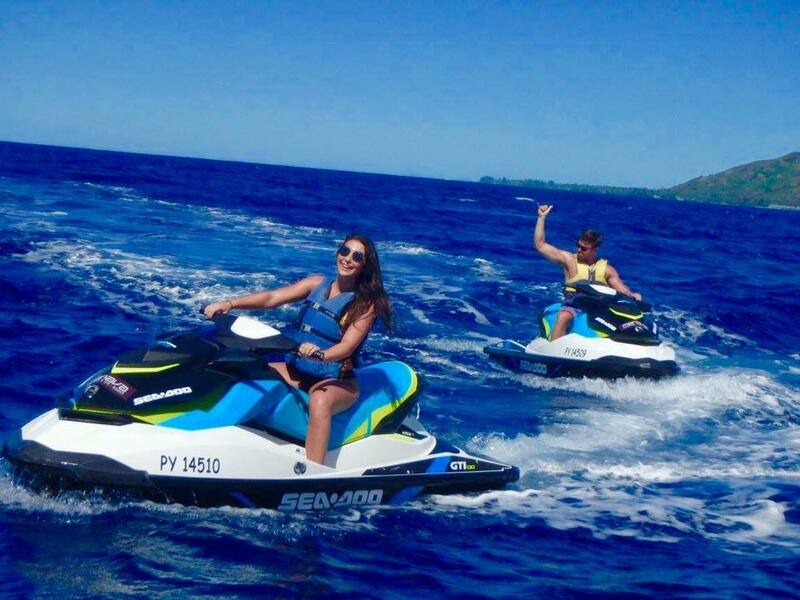 We booked our Moorea activities through our hotel and packed in a jet ski tour, a spa day, whale watching, peddle boating and swimming with sharks & sting rays. Jet skiing was hands down my favorite activity of the trip. Swimming with sharks and sting rays was super intimidating for me but Ross loved it. I actually was more scared of the sting rays than I was of the sharks because they're all slimy & ugh & I just can't lol. Shark bait ooh ha ha. 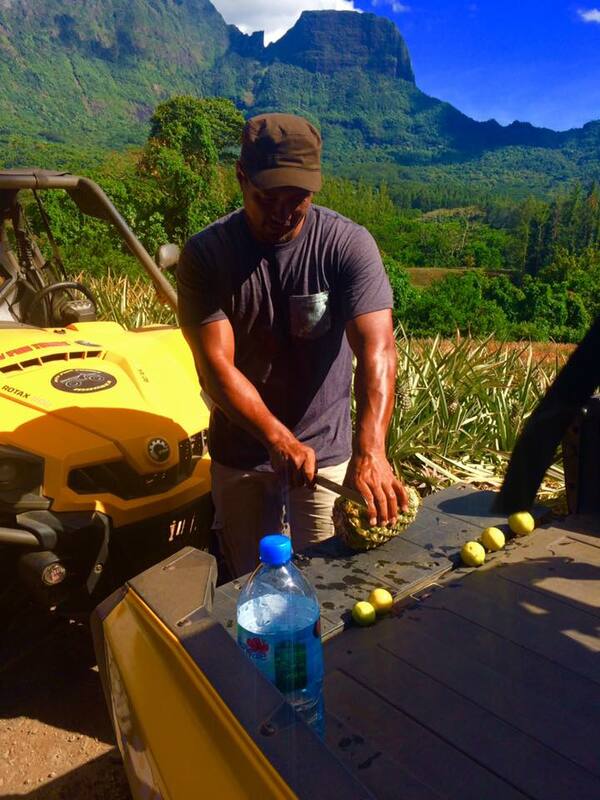 We also booked an ATV tour to explore Moorea further and we got to taste local pineapple (best pineapple I've ever had) and take in incredible views all around Moorea. Tip for ATV tours? Be prepared to get real dusty/muddy and pay extra to get an ATV with a roof. 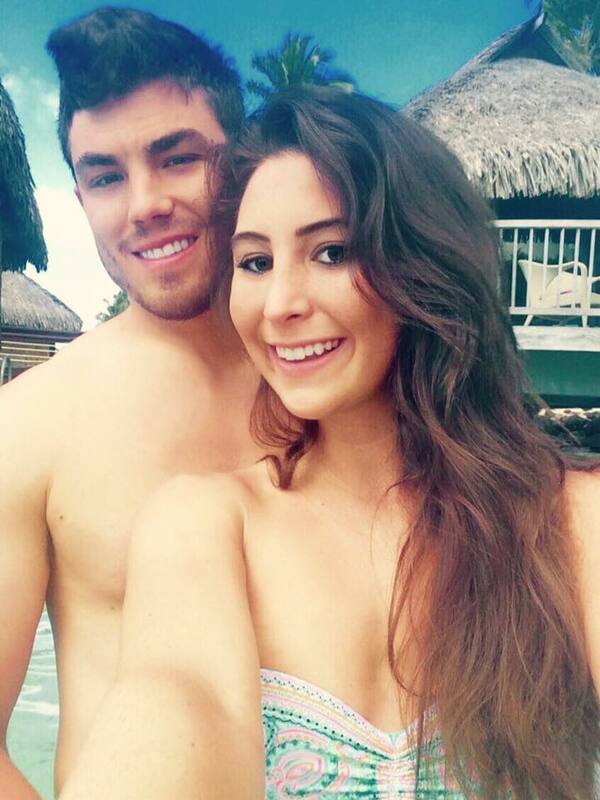 SO many other couples got SO sun burnt throughout the day because they opted for ATVs without a roof. Also bring a bottles of water along for the ride and enjoy! While in Moorea, the main place we ate was at Restaurant Mahana’i which was our resort's main restaurant. The food here was good but all the dishes we tried generally lacked strong flavor and were on the bland side. The favorite dish I tried here? The dish of Tahiti known as Poisson Cru. 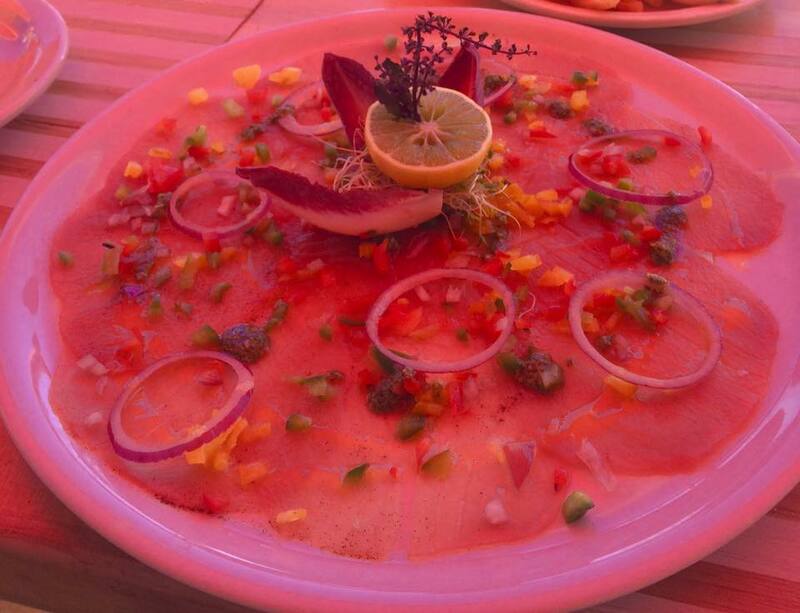 Poisson Cru is a Polynesian dish consisting of raw tuna and vegetables marinated in citrus juice and coconut milk. Restaurant Mahana’i does offer a Manava night on Saturday's which is a traditional Polynesian show with Tahitian dancers and music. Manava night also boasts an enormous buffet with Tahitian seafood and meats galore. Entertainment this night was great but the food still didn't blow us away. Our favorite meal we had while in Moorea was at Moorea Beach Cafe by Bruno Jamais. Moorea Beach Cafe is situated right on the lagoon water front and Ross and I had an amazing lunch here and enjoyed the beautiful setting. This restaurant is also where the Real Housewives of Orange County dined for dinner in Season 10 (don't worry, I am V aware I watch WAY too much reality TV lol lol). For our appetizer, we ordered the Tuscan Way Tuna Carpaccio. While Ross and I enjoyed our appetized, we started whooping it up at this place. We went through three bottles of Veuve and didn't miss a beat. JK we were hammered lol. BUT it was super fun and Chef/Owner Bruno Jamais even came and chatted with us for a bit. Bruno gave us a little bit of his Paris and New York background and then referred us to his favorite entrees. For our entree's, I ordered the Grilled Parot Fish with Truffled Oil Gnocchis and truffle dressing. I had never had parot fish before and it was amazing - it was light and flavorful with the truffle dressing and the truffle gnocchi was divine. Ross ordered the Seared Scallops and Creamy Chorizo Rizzoto. This entree was also spectacular. Did these entrees rival Villa Mahana? Almost. The lunch we had at Moorea Beach Cafe is also one of the top meals Ross and I have had to date and we 100% recommend this place if you ever find yourself in Moorea. For dessert? Bring out the cream puffs! Needless to say, Ross and I left this lunch happy, full, and v bubbled up. While in Tahiti, you can't leave without pearls! Our resort had a great pearl shop - Have a Nice Pearl. Here I was able to get some pearl jewelry pieces for my girlfriends and Ross got me a beautiful black pearl ring. The owners of Have a Nice Pearl were lovely and very helpful. This is a wonderful shop to go to for all your Pearl jewelry needs while in Moorea. Now for island fashion? Keep it simple and keep the heat in mind. We were in our swim suits most the entire trip but for dinners, a lot of my outfits picks came from Selfie Leslie and were either dresses or rompers. Tahiti is certainly a place Ross and I will be back to in the future & I can't wait for the second time around. Happy traveling denv.her. babes! Manuia!